LAWRENCE — In 2002, a team of scientists unearthed mysterious fossil remains in a landfill in Catalonia, Spain. At first, researchers supposed the unidentified fossil could be a form of primate. "That area is very rich in fossils," said Oscar Sanisidro, paleontologist and scientific illustrator with the University of Kansas Biodiversity Institute and Natural History Museum. "The recovered specimen was unearthed by an excavator machine while digging up a sector of the landfill. They could only see a couple of bones poking out from the dirt. They thought it might be a species of primate because of its limb proportions, maybe Pliopithecus, a small monkey found in the area. Additionally, the presence of a lot of early hominoids in the nearby deposits posed it as an excellent place to look for those animals." The preparation of the block, however, revealed the skull and other elements that identified it as a squirrel. A closer analysis found the fossil possessed specialized wrist bones, unique to flying squirrels, that attach to a cartilaginous spur supporting a skin parachute. This parachute allows the rodents to glide down from trees up to distances of more than 400 feet. "They were looking for primate remains — and it turned out to be a flying squirrel," Sanisidro said. "Flying squirrels don't actually fly. They have a membrane in their limbs called a patagium that allows them to glide. You can tell when a flying squirrel has the gliding apparatus based on the wrist bones — one of the wrist bones, called pisiform, is where the patagium anchors and has a strange twisted shape." More than just a curiosity, the study just published in eLife shows the Barcelona landfill fossil to be about 11.6 million years old — making the Miopetaurista neogrivensis specimen the oldest-known giant flying squirrel discovered. Indeed, the find redraws the evolutionary family tree of squirrels, showing giant flying squirrels branched off from tree squirrels millions of years earlier than has been understood until now, somewhere between 25 and 31 million years ago. (Previous studies pegged the split at about 23 million years ago.) The researchers used the "molecular clock," or the typical rate over time that species' genomes undergo mutations, to calculate the time when giant flying squirrels diverged from tree squirrels. "When working with tree squirrels and flying squirrels, some of the features we thought were unique to flying squirrels have been found by our team in some non-flying squirrels," Sanisidro said. "Right now, we don't have features unique to flying squirrels except for the wrist. With fossils of micromammals, 99 percent of the time you're working with teeth. Wrist bones are extremely rare. But now we can link those traits to the postcranial skeleton. Some of the flying squirrels found in the past might not be flying squirrels because they might have had features common to other groups. Right now, we have confirmation with these features — this is the oldest known giant flying squirrel." Further, the Barcelona discovery shows that today's giant tree squirrels have undergone virtually no morphological alterations in the past 11.6 million years. There has been so little change, in fact, the fossil found in the landfill is almost indistinguishable of giant flying tree squirrels found in Asia today. "The one we found is like a living fossil, because it's from the Miocene and it has the same characteristics as modern flying squirrels — it has maintained the same anatomical features for a long time," Sanisidro said. "They are so well-adapted to their ecosystems, they have barely changed." Living in a canopy forest, the giant flying squirrel was likely nocturnal like the ones found in Asia today. "They're a very diverse group," said the KU researcher. "Some have a high number of insects in their diets; others eat fruits. Instead of leaves, some tree squirrels eat bark. The squirrels in our backyards eat nuts, some insects — but flying squirrels are very diverse, and some have very unique feeding strategies." More than just the evolutionary history of squirrels, the fossil from Barcelona sheds light on the natural history of the environment in Spain. "Right now, the climate of that part of Spain is more like the one in California, but back then there were very close subtropical forests — exactly the kind of environment as in parts of Asia where we have living giant flying squirrels today," Sanisidro said. 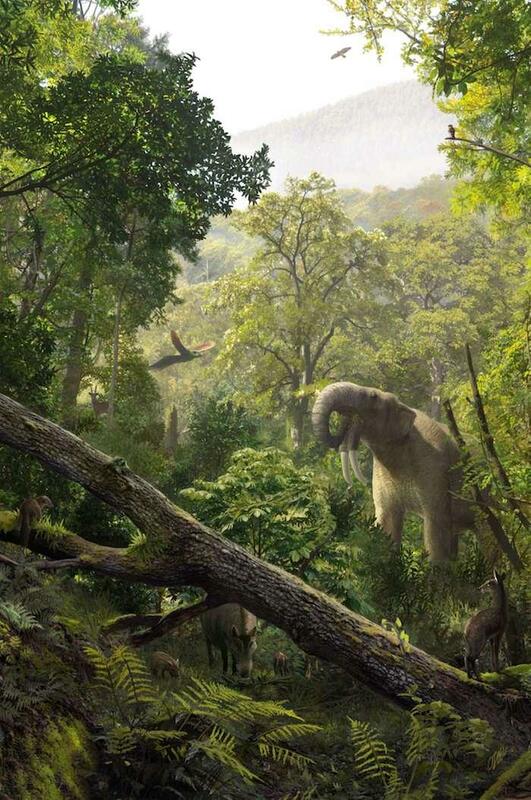 "That environment spread from Spain to China at that point of the Miocene."